Sunspot activity is unusually low. 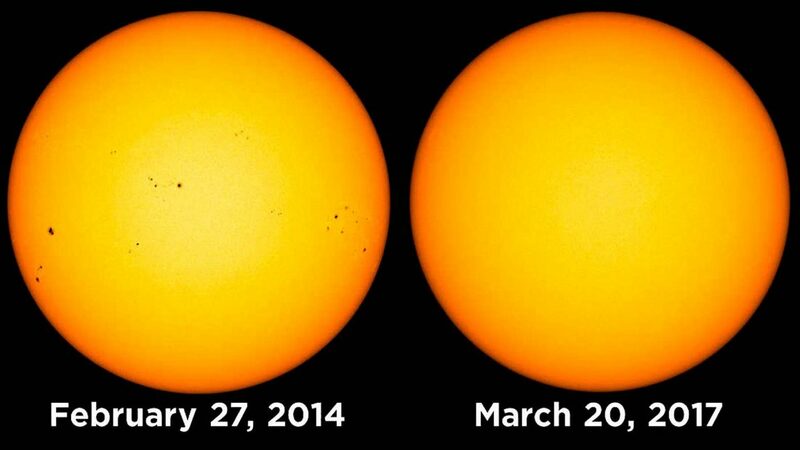 The Sun fluctuates in output strength and visible sunspots across its surface in a cycle that lasts about 22 years. During the past 11 or 12 years, sunspots were predicted to increase based on previous observations, but the Sun remained relatively spot-free past its predicted time. That quiescent period ended when a large solar flare erupted in February 2014, along with powerful shocks from even more energetic regions. It then returned to a more inactive state. The Sun resides in a “bubble” of positive charge with respect to the interstellar medium (ISM), so sunspots and flares most likely result from variations in its electrical supply. Therefore, the Sun might experience cyclic influences involving a galactic circuit. That circuit is of unknown length, but probably includes influences over thousands of cubic light-years. The extent of the electrical energy moving through those “transmission lines” is also not known, but consensus astronomers are constantly amazed by the power output from solar flares. The reason that their observations involve words like “unexpected” and “mysterious” is because they do not accept a basic premise of Electric Universe theory: the Sun is an anode, or positively charged terminal, whose heliospheric boundary is an electric double layer that isolates it from the galactic plasmas flowing through the ISM. Since voltage differences occur within the heliosphere, the Sun probably experiences a charge/discharge phenomenon. It is the Sun’s capacitive, resistive and inductive behavior that drives its activity. Conventional thinking suggests that “acoustical wave-guides” carry hot gas from inside the Sun. That idea is illustrated by a recent press release from Northumbria University. Astronomers announced that they “… have taken a big step forward in understanding a 30-year-old mystery in the process of formation of solar flares.” Naturally, their work uses hydrodynamic models to explain how electromagnetic radiation escapes the solar interior. An electric Sun, on the other hand, means that electric discharges penetrate its photosphere, allowing electric charge to flow into its depths. It is electromagnetic flux tubes, rather than acoustical wave-guides, that expose the Sun’s cooler interior. Those flux tubes connect the Sun’s electromagnetic environment with Earth’s ionosphere, as well. Solar flares can increase the brightness and frequency of Earth’s aurorae when they meet its electromagnetic fields, therefore those flares are composed of charged particles. Space scientists repeatedly refer to ions streaming out of the Sun as a “wind”, and that those atomic fragments “rain down” on Earth. Since they are attracted to and follow Earth’s polar cusps, they are electrical in nature.